As far as I can remember I have had dogs all my life, actually I can say that I grew up with these friends, looking after them and enjoying their company. Early grew my interest in dog breeds, I was really keen on them and tried to find some facts and information about them in books. Our first family pet dog was a lovely black American Cocker Spaniel fondly called Johnny which spent with our family 16 happy years. In 2007 papillon female Demi Doll (kennel Magic Sunrise) arrived to our family and this was the beginning of our story. We were taken up with the Papillon/Phalene breed and Demi Doll became the first show dog in our family. She opened for us the huge world of dog shows and we were astounded by the variety and glamour of it. Like a huge whirlpool it captured us leading through endless adventures continuing till nowadays. With great pride and affection we remember the first show in both Demi Doll’s and our life where she got the nomination BEST BABY IN BREED & Rez. BEST IN SHOW BABY under honorable and well known judge Silvije Deserne from France. Demi Doll has had many great victories in her amazing show career and is a champion of countless countries. On photo C.I.B. ; Black Sea Winner'2010; Cruft's qualification'2011; Baltic CH; Balkan CH; Latvian CH; Lithuanian CH; Bulgarian CH; Estonian CH; Romanian CH; Russian CH; Georgian CH; Belarusian CH; Macedonian CH; Ukrainian CH; Montenegro CH; Moldova CH; Baltic Junior CH; Latvian Junior CH; Lithuanian Junior CH; Estonian Junior CH; Ukrainian Grand CH; 12 CACIB. One more nice thing came to our family with Demi Doll – the first Papillon puppies – a great responsibility and experience. In the years 2009 – 2011 fantastic puppies were born and brought up in our family, loved and well looked-after since the day they were born. It is an indescribable joy to see how the baby puppies open their eyes, take their first steps and how their first teeths grow... With big joy we taught them their first show skills, introduced them to their new families. Each puppy is like a little miracle and you just can’t take your eyes off them when they play. Our aim is – healthy and well-mannered dogs and we put really much effort in achieving it. Jasmin June, Jessamine Jade, Judy Junberry, Jo Joker, Vegas Vojage, Viva Viana, Villy Vanillo, Vito Venturo – these are some of the baby Papillons we remember with much love. They have found their homes all over the world and we still follow their show success. Year 2009 – from the first litter of Demi Doll we kept in our family her daughter the sweet Glamour Girl, fondly called Gaby. She is an inexpressibly lovely and cute girl with great show success: Baltic CH; Latvian CH; Lithuanian CH; Estonian CH; Latvian Junior CH; Lithuanian Junior CH; Ukrainian Junior CH; Belarusian Junior CH and a proud mum of two nice Papillons – Unique Uma and Unix Universe. We follow the ways of life of our Papillons in the world and are delighted by their grand- and greatgrandchildren. We were convinced that only Papillons were in our dog world but then the destiny had prepared something new and different for us. Like a breath of fresh air our first Phalene male Great Gentleman arrived to our family in 2009. This little miracle called Mr.Gently was born and brought up in our family. We kept this „magic” boy for his beautiful, correctly and well built body and lovely temperament. He is a boy with beautiful movements, compact body with extremely beautiful head. He stands out in any crowd because of his naturally good body proportions and great attitude. You will notice his full coat with a wonderful texture. He is outgoing and friendly with people and they often say that he radiates some kind of energy, that he is a dog with the Royal elegance. You can see his achievemets here. On photo to the right we were really proud and honored to represent our country Latvia at the prestigious dog show EUKANUBA WORLD CHALLENGE 2011, Orlando, USA. Being among the best show dogs in the world, winning the qualification in France, leading to the possibility of Latvia to participate in this prestigious show! This is how our love to Phalene breed variety began and we decided to focus only on Phalenes and make maximum effort to leave something good behind us in the Phalene world. We were absolutely sure that we should establish our own kennel DOLLBABIES. How did we find the name of our kennel? Actually it found us and is dedicated to the cutest girl ever Demi Doll. With this we did memorialize Demi Doll’s contribution – endless love, warm-heartedness that she radiates and all her wonderful litters she has given to us. One of Demi Doll’s names DOLL and all her wonderful BABIES who were born in our family - made the name of our kennel and it is DOLLBABIES. Together with her we got acquainted with the incredibly interesting dog world that opened to us with her appearance in our family. In 2011 a purebred Phalene girl Tira arrived to our family from Kimberbells kennel (Norway). We are very grateful to the dog breeder Bente Sorli who placed this lovely girl in our charge. You can see her achievements here. Since 2011 the amazing couple Mr.Gently and Tira have delighted us with their fanatastic achievements in couple competitions in the world. You can see some of their achievements here. In 2011 the first litter of our Phalene boy Great Gentleman known as Mr. Gently comes into the world – 4 lusty boys – Royal Rio (lives in the Namaste kennel in the USA), Ringjoy Rey (lives in Freetains kennel Norway), Rubeen Red and Ringstar Roy. We are really pleased with Rey which is now Norwegian CH and Rio which is the champion of several countries and US champion and now is Grand Champion of the USA. On photo to the right Rio in USA, winning his first BEST IN TOY GROUP 3 place. Rio is Lithuanian Junior Winner'2012; Latvian Junior Winner'2012; Eurasia 1 & 2 Junior Winner'2012, too. 1st December 2012 was a very special day in our kennel – we could welcome the first phalene litter – 2 boys and 3 girls. The proud parents, of course, Mr.Gently and Tira. We keep in our family 2 babies Abelle and Asher – our future hope. In 2013 one more purebred Phalene girl Annie joined our family. She arrived from Putterflies kennel in Sweden and we say a big „thank you” to the breeder Matilda Lindblad for this pretty girl. Annie can be very proud of her grandfather – Ianus Von Xenellos Gladness Europa Junior Winner'2007; Vice World Winner'2008 and World Winner'2009; Topwinning Phalene '2011 & 2010 & 2009 in Sweden! More info about Annie here. We were really proud and honored again to represent our country Latvia at the prestigious dog show EUKANUBA WORLD CHALLENGE 2013, Orlando, USA. And again being among the best show dogs in the world, winning the qualification in Budapest, leading to the possibility of Latvia to participate in this prestigious show! This year Mr. Gently was chosen to the final from 42 the TOP DOGS from the whole world! With this victory Mr. Gently won the most outstanding achievement in his show career - EUKANUBA WORLD CHALLENGE TOP 12 FINALIST, 2013! AWARDING CEREMONY - TOP DOG OF THE YEAR 2013 in LATVIA! It is unspeakable joys that kennel Dollbabies dogs have achieved top awards in 2013! Mr.Gently third year in row have achieved the highest scores and are nominated as ALL BREED TOP DOG OF THE YEAR 2013, LV! ALL BREED TOP DOG OF THE YEAR 2013, LV! ALL BREED TOP DOG OF THE YEAR 2012, LV! ALL BREED TOP DOG OF THE YEAR 2011, LV! And Mr. Gently son DOLLBABIES ASHER ART OF STYLE runs his father's footsteps by achieving the highest scores and are nominated as ALL BREED TOP PUPPY OF THE YEAR 2013, LV! It is a huge honor and pleasure to be the best among several hundred of breeds, and thousands of dogs! as well as CACIB, CAC, BEST FEMALE over champions and finished as BOS! From the International FCI Dog Show „EUROPEAN WINNER 2014”, Brno, CZ! Dollbabies team brought back 4 prestigious titles that are fantastic results for the kennel! Our new hope Dollbabies Bono Bliss Of Sound obtained great success by winning BEST JUNIOR IN SHOW at the most prestigious AMERICAS & CARIBBEAN WINNERS`2014 Dog Show, Cost Rica. December 2014 will go down in kennel history as the debut to breeder group competition with fantastic results, winning 2 times BEST IN SHOW BREEDERS GROUP! We are very proud of Abelle, Asher and Bel (Bučiņa). Judges Mr. Carsten Birk from Denmark & Mrs. Jasna Matejcic from Croatia made those days unforgettable! The year 2015 begins with a very significant events and awards for the kennel! For me as a breeder is a huge honor on ceremonial occasion to receive - Latvian Cynological Federation (LKF) the highest award "BADGE OF HONOUR"! *The Badge of Honour and the diploma was presented to me for merits for LKF and my kennel achievements in the dog world! * LKF Badge of Honour is presented for special merits and limited! We are very proud that Mr. Gently son goes in his footsteps! During the show season in Latvia Asher 15 times stood in podium for BISS/ BIS and BOG placements! This time Dollbabies are proud of WW`15`14 Dollbabies Abelle Art Of Elegance, she became BEST FALENE at Latvian toy dog club and res BEST DOG at the club! From the International FCI Dog Show „WORLD WINNER 2015”, Milano, Italy, Dollbabies team brought back 4 prestigious titles that are fantastic results for the kennel! Fantastic results at brace and breeder`s group competitions at WDS 2015, Italy! In both competitions was selected at the final TOP 10! What a memorable moment! After wining BEST OF GROUP at Monaco, our phalene boy Mr. Gently and Andrej had a big honor to present IX GROUP and phalene breed to Albert II, Prince Of Monaco! 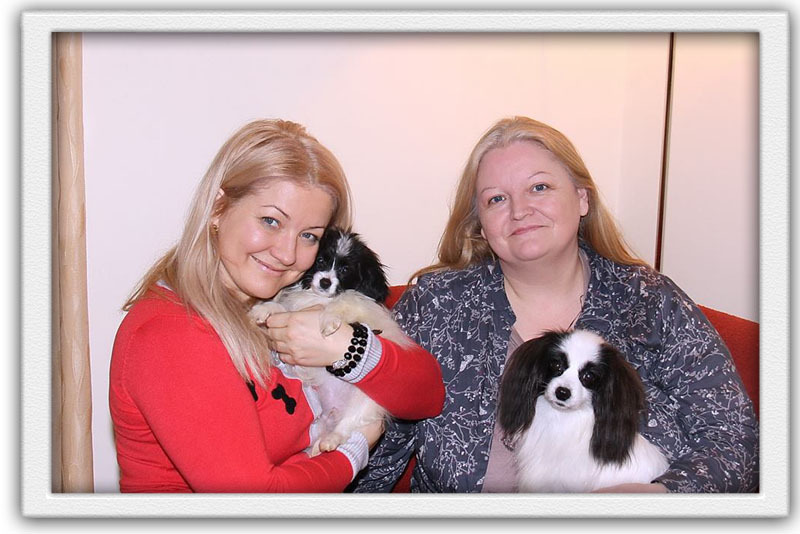 Latvian TOP DOG OF THE YEAR 2015 results are announced and Dollbabies kennel won 1st place in 4 nominations! This is our history, maybe a little bit unusual, but told you with pride and huge love to the Papillon/Phalene world. Life is like a rollercoaster that takes us up and down ...and up again, it is never boring and has always prepared new challenges that are waiting for us in the future. Our story goes on and every day we open a new page to put down some nice events, new achievements or just some thoughts or feelings.